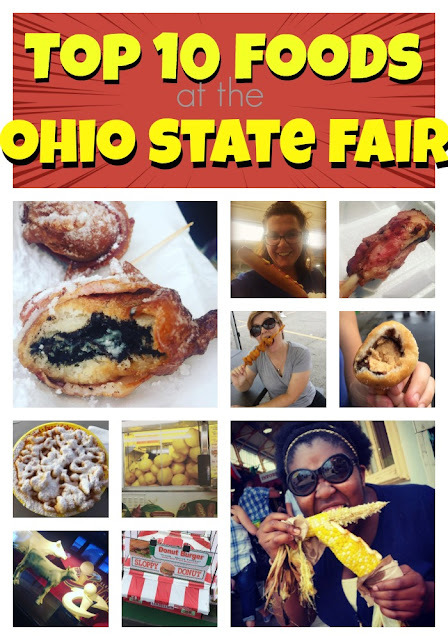 Food Hussy Road Trip: Ohio State Fair Food Bucket List! | The Food Hussy! Food Hussy Road Trip: Ohio State Fair Food Bucket List! Well I just went to the Ohio State Fair for the first time this week - I got to cook in the Taste of Ohio building for my friends at the Ohio Pork Council! And after tasting so much great food - I decided to make it a little easier for my friends and give you a run down of the things you must eat! 2. Lemon Shake Ups - Another thing any true Iowan would tell you - lemonade tastes better at the fair! (It's the same reason LaRosa's is better at Kings Island and I have no idea what it is! haha - but hey - just go with it! 3. Deep Fried Buckeye - Now while my first bite was of the oreo variety - there is nothing more Ohio than a buckeye - so why not eat it deep fried!!! 4. Funnel cake - a staple for every state fair attendee! Just remember to wear a white shirt if you're eating this one! 5. Pig Wings - In the Taste of Ohio building - there are booths for each of the Ohio "foods": eggs, poultry, beef, pork and wine. I hung with my pig people and they gave me what they call a "pig wing" - it's some sort of ham/shank area bone of goodness - which is why I loved it. At the time - I was really stuffed and took a bite and was like, "Yeah that's nice." Then I went home and my stomach settled and emptied a bit and I went to the lovely styrofoam container they sent home with me. And O.M.G. This was heavenly!!!! So yes - get the pig wings!! 6. Gator Kabobs - My husband loves gator and I'm super jealous that Lisa found these as I was searching the Midway for them. If you've never had gator - it tastes a bit like a chicken and a fish had a baby. It's got a chickeny texture but more the flavor of a white fish. So if you're adventurous - go for it! You'll be glad you did! 7. Corn - As an Iowan - no State Fair food list would be complete without corn. Do NOT get the corn unless it's the kind roasted in the husk and they hand it to you like this! Seriously - this is the only way to eat corn on the cob at the fair! 8. Donut Burger - These photos are everywhere! I've had a donut grilled cheese and it's amazing so I can guess that a Krispy Kreme burger would be just as good!!!! It seems odd - but again - go for it! 9. Foot Long Corn Dog - Along the lines of the Funnel Cake - it's a must have. Don't go for the regular length dog - do it right! 10. And last - but not least - the Butter Cow! You can't actually eat this food - but it's still food! This actually originated at the Iowa State Fair in 1911 but I think Ohio does it justice. The Butter Cow is in the Dairy Building and has a great butter display honoring the World Champion Cleveland Cavaliers as well! I hope you'll enjoy the 2016 Ohio State Fair as much as I did!